It’s beginning to look a lot like Christmas, the most wonderful time of the year! Santa Claus is coming, Rudolph’s nose is glowing, and The Beggars are singing everyone’s favourite Christmas songs around the Christmas tree. Get into the Festive spirit with this wonderful concert full of our favourite carols, songs and sing-alongs. Featuring the beautiful playing and three part harmony singing of The Beggars, and presented in their relaxed and friendly style with projected images providing the visual background and atmosphere. Make a list, check it twice – The Beggars are coming to town! Please note > This event is General Admission in the MECC Plenary Halls. Please call the Box Office on 4961 9777 to advise if you have Wheelchair, Companion Card or Special needs requirements before completing your booking. Brought to you by MAP Pharmacies West Mackay and Ooralea. Why not make your experience complete and enjoy an Antipasto Platter, available at pre-show and interval. Platter with smoked cheddar, gouda cheese, green stuffed olives, char-grilled capsicum, salami and water crackers. (GF and vegetarian options available). Pre-purchase > Platters only available to pre-order until 12pm on the day of the event, unless the event is on a weekend and the date would be the Friday before the event at 12pm. Please note > You are not able to take food into the auditorium. We do encourage you to come along to the venue 1 hour prior to show time, so that you have plenty of time to enjoy it. Alternatively, if arriving late, just let our bar staff know that you’d like to pick up the platter from our Interval drinks table at interval. Collection > Platters will be available for collection at the bar. Buy at the event > Platters will be available to purchase at the event from the bar pre-show and at interval (where applicable). 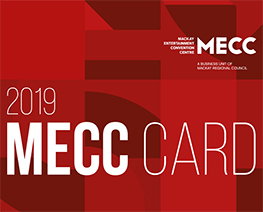 Your membership entitles you to purchase 2x tickets (per show) at the discounted MECC Card price, providing you personally present your membership card. Membership cards are not transferable - only the card holder can purchase discounted MECC member tickets. Receive the latest news, exclusive offers and event information from the Mackay Entertainment and Convention Centre straight to your inbox. © 2018 Mackay Entertainment and Convention Centre. All rights reserved.